Being a car salesman isn’t the easiest job in the world, but its not the hardest either. There are some basic things a car salesman needs to know about car buyers in order to become successful in this often misunderstood and unappreciated profession. These things are not negative or positive they are simply facts. 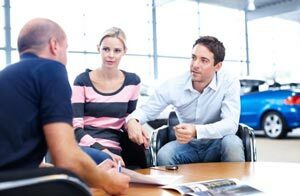 The facts that every car salesman should take into account every time they see, talk to or communicate in any manner with a prospective car buyer. Practically every car buyer becomes anti-car salesman when its time to buy a car. All they can think about is all the negative things they have ever heard about car salesmen and buying a car. This is one the toughest parts of the job of being a car salesman because telling them won’t win them over. Knowing how they think and what they believe will help you sell more cars. 1. Customer Perception is Everything: Regardless of what is fact or fiction whatever the car buyer perceives to be true is fact (at least in their mind). This is probably the most important thing that every car salesman needs to know because it can easily cost you a sale. Over 90% of car buyers today start shopping online before they ever hit the showroom floor. They can visit any number of websites and blogs about buying a car and read all kinds of things that might not be true, but it doesn’t matter if they believe they are true. Whatever the car buyer believes is true and everything the car salesman says is false until they change they way they think and only the customer can change the way they think, but the car salesman needs to know that they can influence them. According to the Autotrader survey of car buyers, car salesman influence over two thirds of car buyers.Not because they told them they were wrong, but because they educated their customers. It’s because they built rapport and earned their trust by showing them and not by telling them. They used third party proof of all types to show them what someone else said that coincides with what they are saying in order prove to them that the car salesman is correct.Getting into a debate with a customer is the quickest way to lose a sale unless you have the proof that backs you up. 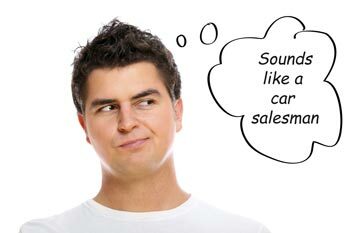 According to the car buyer anything that comes out of the mouth of a car salesman is a lie unless there is proof otherwise and a reason to trust what they are saying. Every car salesman needs to know that they need to deal with whatever the car buyer believes to be true regardless of how ridiculous or far fetched it my be. You need to ask questions and learn what your customer believes, address their needs, understand their concerns and determine what motivates them to buy a car. No it’s not all about price regardless of what the car salesman believes. Its what the customer perceives to be true. That’s why listening is more important than talking when selling cars for a living.I have personally proved this over and over many times and I am sure that you have too. I have sold cars to people for less than true net that they felt they were being robbed and I have sold cars to people that paid 5K in front end profit that thought they were getting a great deal. It all about the customer perception and that is what sells cars therefore every car salesman needs to know and understand this truth. 2. Car Buyers are Liars: You’ve all heard it said before because it’s true. They believe that stretching the truth or outright lying is part of the car buying process. It doesn’t mean that they are bad people or habitual liars they just believe that’s how the game is played. I have even sold a car to priest that lied to me during negotiations and after delivery I asked him about it. He told me that is how car buying works and that it isn’t really a lie when negotiating the purchase of a car.I can’t argue that point because that’s what people believe including the clergy so accept that fact and deal with it. People will lie about receiving prices from another dealer, they will lie about their trade in and they will lie about anything that they believe will help them get a better deal. Plus don’t forget about the other common lie that car salesmen are told everyday; “I will be back”. I am not saying that you need to be a cynical person to be a successful car salesman, but that the car salesman needs to know this fact. The car salesman needs to realize that people that haven’t told a lie in their life have no problem telling a lie when they are buying a car because they believe it’s expected and therefore not a lie. The job of the car salesman is figuring out when they are lying and when they are telling the truth without accusing them of lying as not to insult them a or have them tell you that they will be back. That’s why we need to push, prod, ask questions and try them on when we sell cars. 3. It’s Always Too Much: Everyone feels like it’s too much no matter what they are buying. You probably do it yourself every time to go to the grocery store or pickup the check at a restaurant. Costs are always going up, they are never going down and making a major purchase like an automobile intensifies that feeling. Everyone wants to pay less and that’s just how things are regardless of want they are buying. If the customer doesn’t see value in spending a certain amount of money its always too much. That why every car salesman needs to know that its important to build value in your product, yourself and the dealership in order to make a sale. Value justifies the amount the car buying is spending so build value and make the customer believe they are getting their moneys worth. 4. You Don’t Care About Their Needs: This is a very common statement among car buyers because they believe the car salesman is trying to sell them what they want to sell them rather than what they think they want. As car salesmen know we don’t switch cars to sell them something different than what they want, we switch them because we want to sell them a car. It’s usually about price, payments and their needs (unless there is a bonus on a certain car did I say that out loud). The car salesman knows that they don’t have a chance to make a sale unless the customer is happy with their selection, yet they continue say that we don’t car about their needs. It all goes back to listening to the customer, asking questions and listening some more. If you listen closely you can put this myth to rest by asking them the right questions and giving them choices, but not too many. Let them know that you want them to be happy and satisfied with their purchase in order build your customer base and to get them to send you referrals. Every car salesman needs to know that you need to address their needs and make sure they are choosing the right vehicle for them in order to be able to close the sale. (Unless they are get-me-dones) If you have a question about this car salesman needs to know item see #1 above. 5. They Want to Feel Like They are Getting a Good Deal: This item about what every car salesman needs to know is just common sense. Everybody wants to feel like they are getting a good deal no matter what they are purchasing. Nobody wants to feel like they are getting screwed. When you are working with a customer you need to make them feel that they are getting a good deal. They are across the desk from you trying to feel good about this deal and that’s all that it really comes down to in the end. Build value, educate them, influence them and sell them a car, but they need to feel good about their purchase before they will say yes. They way they feel goes back to what the car salesman needs to know number one. The customer stills needs to feel that they are getting a good deal regardless. All of these things that car salesmen need to know are important and it doesn’t matter if they are buying a car from a “One Price Car Dealer” or the traditional car dealer so you can see that it’s not always about price, but the way they feel. Learning, understanding and making these things a car salesman needs to know part of your very being will help you sell more cars and make more commission. People like getting new cars, but they don’t like buying them, but you can change that and create a customer for life. Car salesmen and car saleswomen are practicing this everyday and making the big bucks and you can too! KB, great post!! I'm new to the industry as of May of 2014. I'm an internet sales manager and enjoy learning about the industry. Thanks for covering so much in this post. I look forward to reading your posts.